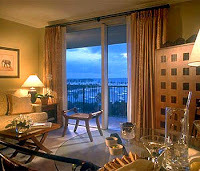 Few destinations can boast such a distinctive and colorful character as Coconut Grove. In the heart of it all sits the luxurious Mutiny Hotel, on Sailboat Bay. A bright swatch of coral set against the intensely blue South Florida sky, the Mutiny's 12-story tower sets the tone for its interior. Exquisitely decorated in a tropical British Colonial motif, the hotel's 120 thoughtfully appointed, spacious one and two-bedroom deluxe suites and penthouse suites all have breathtaking bay or city views.